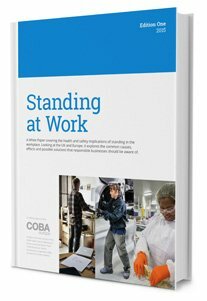 A White Paper compiled by COBA Europe exploring the health and safety implications of standing in the workplace. Looking at the UK and Europe, it delves into the causes, effects and possible solutions that responsible businesses need be aware of. Statistics relating to MSDs and related occupational illnesses in the UK and across Europe. The latest guidance on what to consider for employees whose jobs require standing in the workplace and prolonged standing.